Four County Career Center students in Archbold recently donated blood during the HOSA Future Health Professionals sponsored Red Cross blood drive. HOSA members planned and coordinated the drive and students assisted with donor registration, testing, and blood donations. Shown is Collin Harris of Delta. HOSA Advisor Robin Hill, Health Careers instructor, coordinated the event. 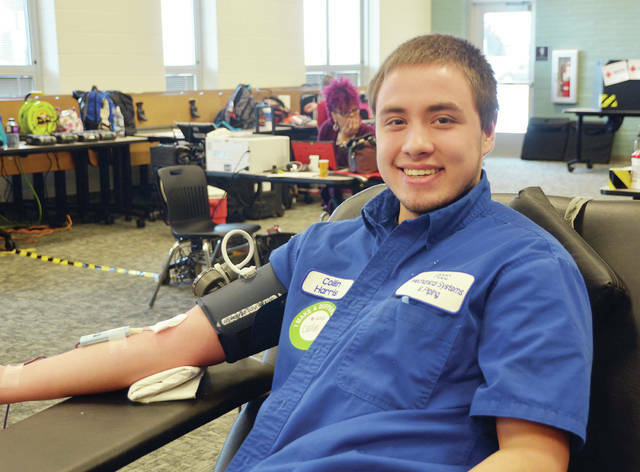 https://www.fcnews.org/wp-content/uploads/sites/45/2019/03/web1_FCCC-2019-blood-drive.jpgFour County Career Center students in Archbold recently donated blood during the HOSA Future Health Professionals sponsored Red Cross blood drive. HOSA members planned and coordinated the drive and students assisted with donor registration, testing, and blood donations. Shown is Collin Harris of Delta. HOSA Advisor Robin Hill, Health Careers instructor, coordinated the event.